Last Friday evening, on his way home from work, SP detoured down to the Original Farmers Market in South Fayette. He came home with a lot of peaches, tomatoes, some small yellow tomatoes, zucchini, and eggplant. The peaches looked so yummy and their smell wafted throughout the kitchen. Every time I went by the peach bowl, I could smell them. 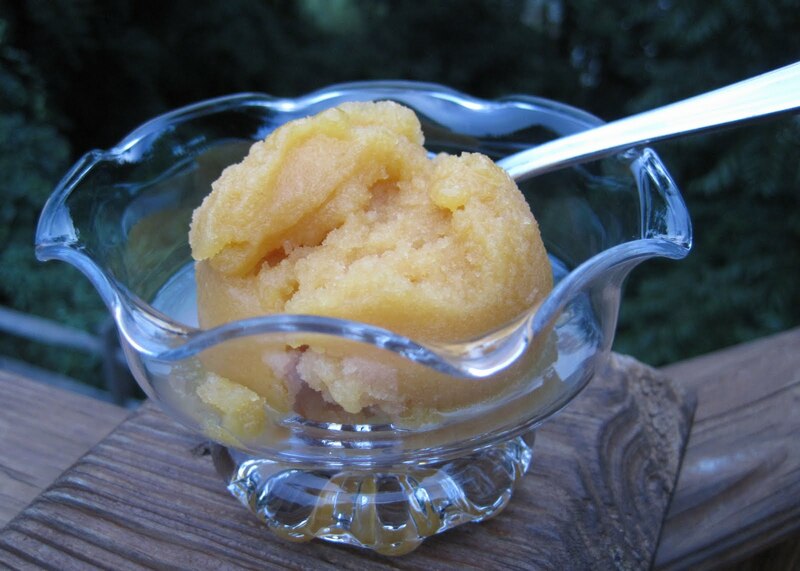 We've been enjoying the peaches but had so many that we decided to make a peach sorbet. 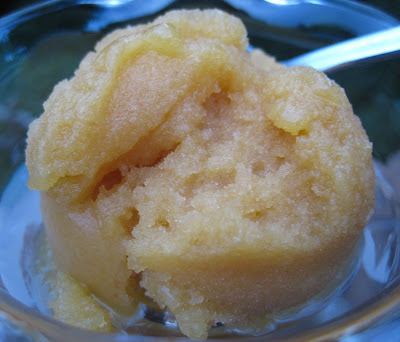 None of my recipe collections/cookbooks had a peach sorbet recipe, and I definitely wanted a fruit sorbet without corn syrup (which was in the 2 sorbets we made last summer and I figured I could just substitute any fruit in with the water/syrup, etc.) so I started googling. There are a lot of peach sorbets recipes, from the very simple (peaches, water, sugar) to ones with additional flavors like ginger or orange or lime, plus lots with suggestions to add limoncello or Cointreau or peach schnapps or white wine. They all sounded good. We settled on a Peach & Champagne Sorbet. Oh my gosh. This is very tasty. Good peach flavor. And, to my surprise, champagne flavor as well. I usually expect that alcohol won't be very noticeable in most dessert recipes, but this definitely has a delicious champagne flavor. This is a terrific, light dessert - much better than last year's strawberry sorbet and better than the mango sorbet, which was pretty darn tasty. Definitely will make this again! Put the peaches in a large saucepan and cover them with boiling water. Cook for 2 minutes. Drain and rinse in cold water. Peel the peaches; halve them and remove the pits. Transfer the peaches to a food processor and coarsely puree. Pour into a medium bowl. In a medium nonreactive saucepan bring the sugar and 1/2 cup of water to a boil over moderately high heat. Add 2 teaspoons of the lemon zest and let simmer about 3 minutes. Remove from the heat and set the syrup aside for about 10 minutes. Strain the syrup into the peach puree and blend well. Add the champagne, the lemon juice, and the remaining 1 teaspoon lemon zest. Stir Well. Refrigerate until chilled. Transfer to an ice cream maker and freeze according to the manufacturer's instructions. *Here is where we found the recipe.